What better way to wrap up our Southern Dinner than with a bread pudding? Packed with fresh berries, made with wonderful brioche, and topped with whipped cream, this dessert is decadent and heavenly. Though we followed the recipe to the letter, we wonder if we might have overcooked it. Here's why. For our Southern dinner of Buttermilk Chicken, Fried Okra and Bourbon Mint Tea, we needed something light and springy to balance out the meal. And since we were cooking a meal for six, we needed some sides that were a bit less involved. 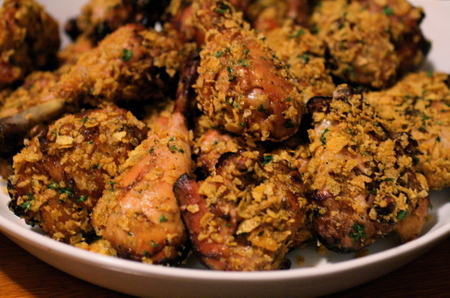 This recipe practically leapt off the page. Sugar snap peas are delightful. Their sweet, fresh taste lightens up any meal and makes for a wonderful side, especially when you throw mint and orange zest into the mix. "Southern" is often synonymous with "fried." In a rare exception for us and vegetables, "fried" is also synonymous with "okra." In our minds, there are few things more Southern than fried okra, and there's no better way to prepare okra than breading it and dropping it in a big pan of grease. We've served okra to a lot of guests, and most of them are skittish about it at first. "Okra?" they say. "Gross. It's so slimy!" After their first bite, though, they're positively hooked. If you think you don't like okra, that's only because you've never had it fried. No Southern dinner is complete without fried chicken. In our case, we decided to go for "fried" chicken, using Food & Wine's recipe for Buttermilk Chicken with Crispy Cornflakes. Once we get through all the recipes for this dinner, you'll understand why we went with a lighter chicken. As we've alluded to before, we're both originally from the South. As such, we have an affinity for both sweet tea (thank goodness there aren't many places in town that serve it) and bourbon (thank goodness it's available everywhere). 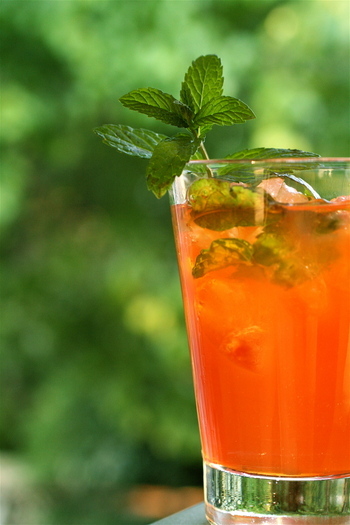 With Spring hitting on all cylinders and the Derby just behind us, we couldn't pass up Everyday Food's Bourbon Mint Tea. Since we were having a group of friends over for a Southern dinner, we thought this was the perfect cocktail to start the evening. As we've said before, sometimes it seems like dessert without chocolate just isn't dessert. It's like a palate cleanser while you're waiting for the chocolate dessert. 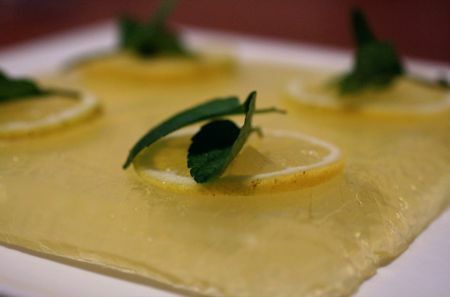 But this Limoncello Gelee was the perfect way to end our recent Italian meal. It's light and tart, with an effervescence that sparkles on your tongue. 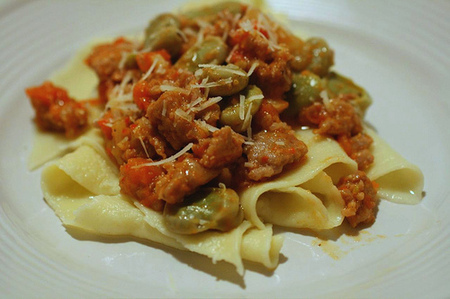 Although the Fresh Pasta with Favas, Tomatoes and Sausage is plenty of food for an entree, we wanted to add a nice, tasty vegetable on the side. These Braised Baby Artichokes seemed like just the thing. Neither of us has ever cooked very much (okay, at all) with artichokes, but this dish sounded like a great, simple place to start. It didn't turn out very well (largely because I [Zach] misread one crucial direction). 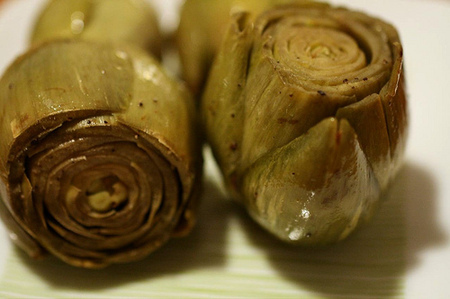 Now that we've cooked with artichokes, though, we're eager to try some more dishes with them. We live in a transient city. In my first few years here, I attended well over a dozen going away parties and it seemed that just as I had met people with whom I really wanted to be friends, they were moving away for grad school or other cities or experiences. The longer we live here, we continue to meet wonderful people and make new friends. Some have stuck around, but other have needed to go, and the going away parties continue. 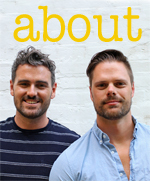 We knew and liked Will & Haven, but didn't know them all that well. Having them over for dinner seemed a great time to both say goodbye but also get to know them better. In some ways, there's no better way to get to know someone than cooking with them, especially when it's two novices trying to make homemade pasta. While Will & Zach were in the kitchen wrapping asparagus, Haven & I attempted pasta in the dining room. This recipe doesn't demand fresh pasta, but we thought it would be fun to do with guests. For the pasta, I used a Gourmet recipe from Smitten Kitchen that I had saved last year. A brief note about our pasta-making history: We have only attempted fresh pasta once before, well over a year ago, when we purchased a pasta machine. That time, we were making dinner for new friends -- Regi & Kate -- and the pasta, while not inedible, was very fat and too chewy. Since then, the pasta machine has remained in the closet, ashamed and collecting dust. But hey -- we're adventurous and not afraid to revisit pasta, so the machine came out, got dusted off, and we were ready to get started. Our friends Will and Haven recently left D.C. for the other Washington. Before they moved, though, they said they wanted to cook something for The Bitten Word. For their Going Away Dinner, we wanted a meal that was delicious, of course, but also fun for a group to make together. We had them over last week, on a positively gorgeous Thursday evening -- late spring in D.C. is one of the most glorious times of year anywhere (take that, Seattle!). We settled on a light, refreshing Italian menu that showcased some delicious in-season vegetables. 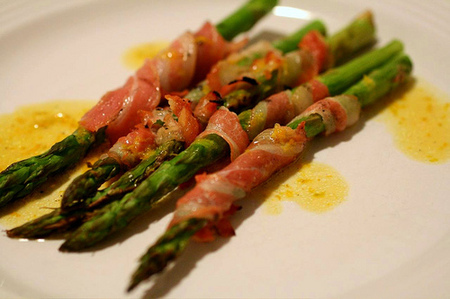 The meal could not have gotten off to a better start, with this appetizer of Pancetta-Wrapped Asparagus with Citronette. To cap off our meal with our friend Whitney, she picked out this peanut-butter pie from Everyday Food. 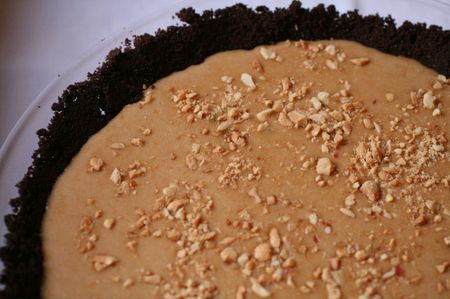 It sounded like a winner: A simple, creamy, chocolatey, peanut-buttery icebox treat. But the results weren't quite what we'd hoped.